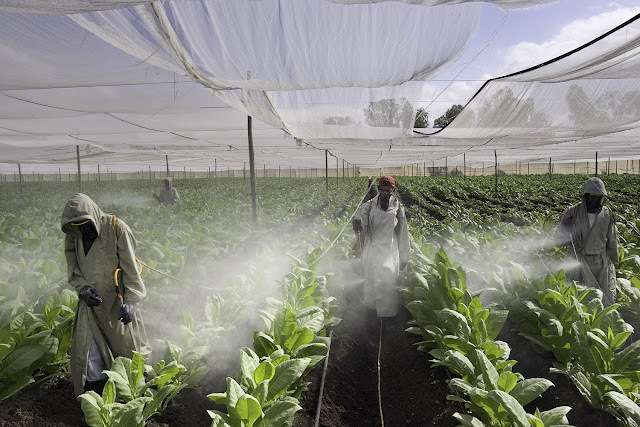 Spraying fungicides on tobacco in a greenhouse in Jalapa, Nicaragua. Photo: courtesy Peter Essick. Pesticides cause a multitude of adverse effects on humans. However, they are especially harmful to children. They may have something to do with the mass-shootings in schools all over America because some of them are neurotoxins. This means they affect and damage the central nervous system and the brain of all animals, including humans. Warren Porter, professor emeritus of zoology at the University of Wisconsin, conducted experiments with groundwater – water drawn from the ground of farms with typical levels of pesticides and fertilizers. He chose farm water contaminated with the insecticide aldicarb, the herbicide atrazine, and nitrogen fertilizer. He tested that mixture on white mice and deer mice. The concentrations of the fertilizer with each of the pesticides (aldicarb and atrazine) in the groundwater were of the order of magnitude the Environmental Protection Agency says the chemicals cause “no unreasonable harm to man and the environment.” In other words, Porter put to the ultimate test the assurances of EPA and the chemical industry about the toxins EPA registers (approves) – that they are safe and farmers may spray on crops Americans eat. Porter discovered the mixture of common groundwater and farm chemicals had detrimental effects on the animals’ nervous, immune, and endocrine systems. The mice became aggressive and had problems with their thyroid hormones. Their immune system was also compromised in its ability to make antibodies against foreign proteins. Millions of Americans drink the same groundwater mixture that Porter used on the mice. Second, thyroid “disruption in humans,” according to Porter, can have unpleasant consequences for the development of the brain, the growth of our body, and our ability to learn. In addition, the harm of the thyroid can have adverse effects on our immune system generating defensive enzymes to protect us from foreign proteins. After five years of experiments, Porter published his findings in 1999. His work is a warning that contaminated drinking water has the potential of muddling or slowing down or, in the worst case, destroying the intelligence and learning of children while making then aggressive. Guillette found that those children had weakened stamina; could not catch a ball at a distance of three meters; failed to be fully creative in their play, failed to remember meaningful statements after thirty minutes; roaming aimlessly or swimming in irrigation ditches with very little interaction. Thus, some of the evidence is in. Pesticides are dangerous to children. Farmers have been spraying their crops for decades. Unless children eat organic food, there is no doubt pesticides are having their influences on their behavior. In addition, pesticides sprayed over farms become airborne and circulate all over America and the world. This does not mean the young murderer in the Miami, Florida high school mayhem of February 14, 2018, committed the atrocity only because he ate food tainted by neurotoxins. Nevertheless, nerve poisons in the food, water, and air, even in tiny amounts but over a long period of time, do change human behavior, making people and especially children more violent. Clearly, pesticides, but particularly neurotoxins, should have no place in a civilized society. We need to ban them as soon as possible. Our best protection is eating organic food.